"It's Friday. Everything off your desk for your vocabulary quiz. Print your name in the lower left corner." "Did she say print or write?" We had a foot-long stack of little cards we had to memorize over the year, one word and one definition at a time. We worked our way thru the stack one quiz at a time, every Friday. Thelma would tell us once as she walked across the front of the class from the door towards the window exactly how to put our names on the quiz sheet: top, bottom, left, right, print, write. If a student got that one detail wrong, she saved herself the trouble of grading further and marked it with an "F." We did not get "E's" or "nice tries." We knew "F" meant, "You failed. Next." The woman didn't have a heart. She told us to read The Clouds and Lysistrata and Electra and Oedipus Rex. We were compelled to discuss in front of others what she had told us to read. Those who went a night without reading endured a day of public exposure and shame, and Thelma's sneer. We were the sons and daughters of factory workers and bread truck drivers and mail carriers and house painters, yet Thelma expected us to perform as if we were the children of doctors and lawyers and Indian chiefs. 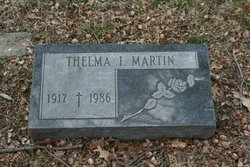 Our dads had fought WW II; we had to fight Thelma Martin, and she had a "take no prisoners" mentality. We hated that woman, and she didn't care. She was the last chance that hometown high school had to leave a stamp on the ones the teachers considered "the best and the brightest, the ones who can make it," and she used a sledge hammer to impress the stamp. At last count, from among my class of "thumpin' Thelma survivors," that woman had helped to produce several Ph.D.'s, lots of lawyers, many school teachers, a few school principals, vice presidents at corporations, a vice chancellor at a university, several engineers, an assistant school superintendent, a pharmacist, a dentist, a few college professors. If there's a factory worker in the lot, it's a factory worker who could discuss Sophocles and Aristophanes with you. I never appreciated her until I got to graduate school. Then I remembered how she had spent several sessions with me helping me to "narrow my topic" for my senior research paper, making it more and more narrow. Finally, it was narrow enough for Thelma: "The Condition of Freed Slaves in Ancient Athens." Following the outline she had forced out of me, I spent days in "the Tower" at the University of Notre Dame Library, with stacks of obscure books before me, taking notes on 3 x 5 cards and filing them away under subject headings in a little recipe box. The paper was pounded out on a tiny Hermes typewriter. It was before the days of "White Out" so every typing error that could not easily be erased meant ripping out the paper and beginning again. I put my heart and soul into that paper. Thelma rated it an "A minus." Thelma wasn't impressed easily.